The Environmental Action Committee of West Marin (EAC) is proud to partner with Amigos Alados (Winged Friends) for the 10th anniversary of the Point Reyes Birding & Nature Festival through education and art. 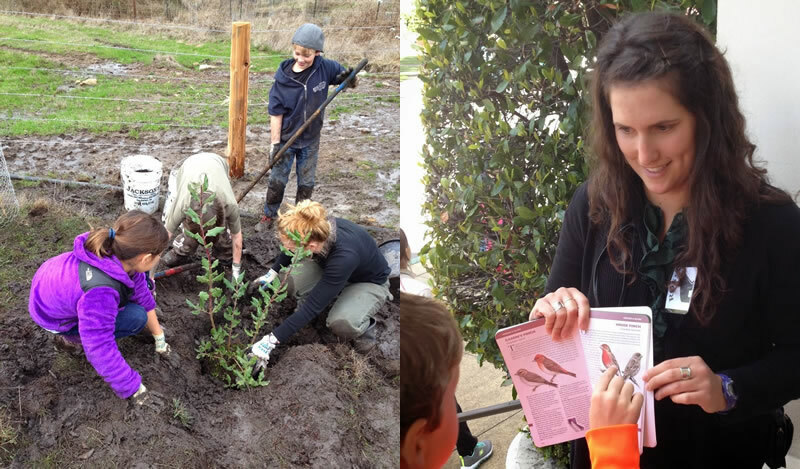 Amigos Alados, a unique international pen pal project was founded in 2007 by friends and educators Martina Gögelmann (Mexico) and Alison Quoyeser (California), who saw an opportunity to connect students across borders to bird conservation efforts. Beginning in the spring of 2007, elementary students at Ross School in Marin County, California, and Primaria Cuauhtemoc in Los Espinos, Jalisco, began studying birds that migrate along the Pacific Flyway between the San Francisco Bay Area and the Sierra de Tapalpa through birdwatching, classroom instruction, and sharing their research and observations with each other through pen pal letters showcasing life cycles, art and poetry. The project identified 16 bird species that migrate along the Pacific Flyway between Northern California and Jalisco, Mexico, to focus the studies and connect the students to each other using pre-made lessons plans and through active birdwatching, games, reading and other activities. Listen to bird calls. Since its inception, the project has reached more than 4,000 students, bringing broader awareness, understanding and appreciation of the plight of migratory birds and their habitats, while also connecting and enriching the students through the sharing of information about the cultures and lifestyles of California and Mexico. During the week of the festival, EAC will be sponsoring two school field trips for Amigos Alados schools (West Marin Inverness School and Lagunitas School) at Marin County Parks to explore habitat, birds and other wildlife. Students will share their findings and experiences with their friends in Mexico. In addition, EAC and Amigos Alados will co-host the free Saturday youth programming, which includes a visit from live bird ambassadors, games, music, face painting and a special showcase of students’ letters and art. Stay tuned for more details coming soon. Amigos Alados is looking for volunteers who are experienced birders and can lead bird observation walks for students. If you are such a person or a teacher who would like to have your students participate in Amigos Alados in the 2019 - 2020 school year, please contact Alison Quoyeser.